German watch company, which is known on the watch market with its unique watch with a single arrow. 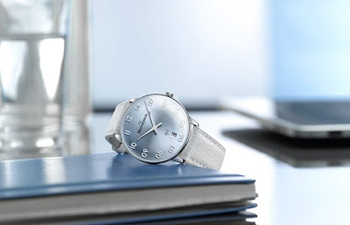 Today the brand announced the release of three new products – the chronograph Singular, the first women’s watch company NEOf and a special edition model MeisterSinger N ° 6 Giambattista Rodella. Models equipped with Basis Unitas 6497-1 caliber with manual winding, 48-hour power reserve. Corps of three new round 43mm stainless steel. Water Resistant – 5 bar. The original chronograph with one arrow combines incredible clarity that is characteristic of the brand models MeisterSinger, and accuracy. A thin needle is located in the center of the dial, is provided to indicate the seconds, and a little 30-minute clock is the epitome of mainstream classic design watch brand MeisterSinger. Another model NEOf – elegant ladies watch, reminding their design model 40’s, 50’s. She is represented in several color versions serebristo-belyy/krasnoe gold, champagne, mauve and blue. Novelty comes on a leather strap bright colors. 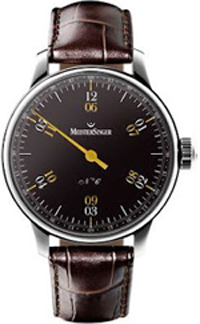 The latest model – MeisterSinger N ° 6 Giambattista Rodella, equipped with a single arrow, was developed by the masters of the brand, inspired by the Italian watchmaker Giambattista Rodella. Original design of the model, its dial, which interestingly are the figures: 12 and 6 are in the top, and 3 and 9 – at the bottom. The rest of the figures presented by Arabic numerals, also located together: 1 and 7, 2 and 8, 10 and 10, 5 and 11. 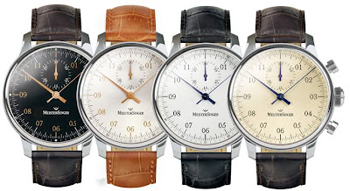 MeisterSinger company introduced two versions of the model, each of which is released in limited quantity – 48 pieces. Buy a watch will be available in Germany and Holland.